How A Horse named “Raven” changed my life…. Raven is spectacular. A rather large girl, well over 1200 lbs. and covered in a shaggy long black winter coat of hair, tapering to huge hooves. 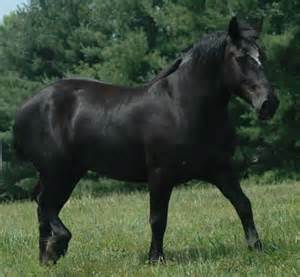 A Percheron she is, complete with elegant thundering gait and a graceful black flowing mane. Her gentle eyes hide the most remarkable intuition I’ve ever experienced, with a gaze that gently probes into one’s very soul, if you let her. I met Raven in Anderson IN, at a very special place (Selah House) for young women struggling with eating disorders. (ED) My youngest daughter was finishing up a two month visit there and in the final stages of her recovery the entire family was asked to come for several days of group discussion and therapy. Part of their care included “equine therapy” ? The next three hours were magical. Raven was introduced to us and stood patiently by my side, at first uncomfortably close. Her bottom was at least six inches higher than my head (I’m pretty big at 6’4 and 230 lbs) and her head was easily the size of my waist. She quietly listened to Dr. Don and Linda as they explained what we were to do and then the “professionals” left the indoor corral and watched expectantly for us to start our therapy. It was a bit intimidating to stand alone that close to a draft horse as massive as Raven, but we did. The goal of the session was simple, but odd at the same time. “We want you to lead Raven through a series of activities without touching her or feeding her. You can talk to her and walk around her, but you can’t touch”, Diane said smiling. An hour later I was convinced I was an idiot . Raven had snorted, stomped and shuffled, but not actually in any of the places I wanted her to go or be. My daughter and I had begged, pleaded and walked her around the entire corral without any of our objectives being met. Desperation was growing, it seemed we wouldn’t get this figured out. Dr. Don explained, we needed to be clearer and more confident in our actions. To walk side by side with Raven walking in between us – to be together in sync, walking in the same pace and stride and she would do whatever we wanted her to. But not if we stood in front of her, behind her or at an angle. Raven was more than happy to follow once we sorted it all out and we soon finished up our assignments. Raven never left our side and as we stopped to discuss what we had learned… tears flowed and Raven bent to nuzzle my daughter. Like she could understand her… feel her pain, her frustration with life. That horse was touching a very intimate and tender spot in my girl and the spectacular truth of it hit me. Here was this amazingly huge draft horse, carefully and lovingly comforting a tiny young woman without any words. Equine Therapy indeed! I left the barn knowing a whole lot more about myself and how I should be leading my family than time permits me to share. Crazy I know, but seriously….that horse “got us”. She could sense the struggles my daughter and I were having. The ways we didn’t trust each other and the uncertainty of how to move forward from where we were in life to being open and clear with each other as a dad and daughter should be. The mystery and beauty of that afternoon will be a treasure for life. That beautiful girl Raven, was kind, sensitive and patient enough to teach us some profound lessons on how to be a family. How to be a team and how horses can sense our deepest fears, feel our pain and release our tension by us taking the time to simply “be” with them. Raven is a an amazing example of the power of beauty and gentle strength to unravel some of the tougher emotional knots that tie families up for a lifetime. 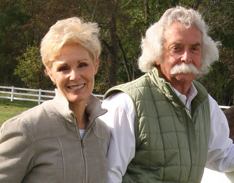 Equine Therapy provides deep insights to many families in crisis. If your family is struggling with an eating disorder situation… I highly recommend looking up Dr. Don and Linda to see for yourself what I’m talking about. And to Dr. Don, Linda and Raven… “thank you” from the bottom on my heart !